Your company dashboard provides you with an at-a-glace overview of your company’s finances, plus a list of important reminders. inniAccounts’ powerful reminder system keeps track of important upcoming deadlines including overdue invoices and bills, payroll reminders and even tax returns. Taking care of any actions when they appear on your dashboard is a great way to ensure you are up to date and don’t miss any important deadlines. Any items in red are nearing a deadline or overdue and need urgent attention. 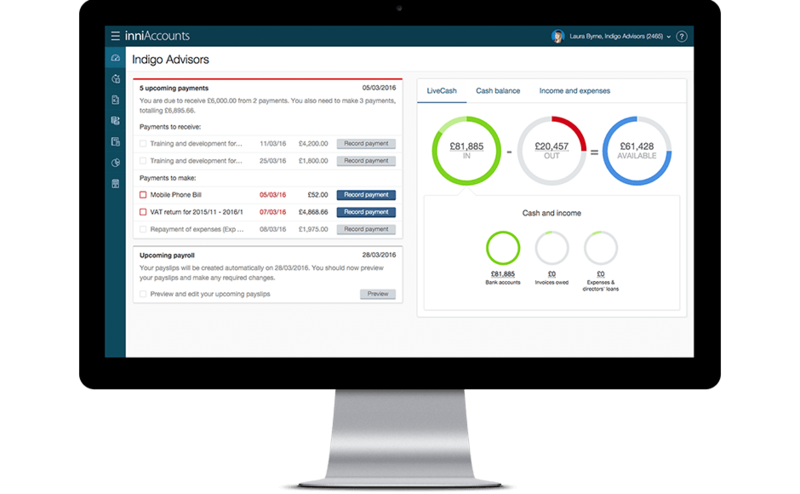 LiveCash provides you with a real-time overview of your company’s finances, split into three distinct sections: the money you have in the bank, upcoming expenditure, and finally the cash that you have available today. By clicking each pie in LiveCash you can explore the detail and customise your view. Short of cash or in the red? In order to help prevent overspending, LiveCash is intentionally pessimistic. It won’t include invoices that you’re yet to receive payment for in your available cash, and the tax calculation includes a real-time forecast for your VAT and corporation tax payments. In addition to an interactive view of LiveCash, you can also view your cash balance over the last 12 months and pie charts showing your top sources of income and expenditure. Click here to read more and watch a video about LiveCash.